Founded by Hibaaq Osman, Karama is a regional NGO based in Cairo, Egypt with an office in Amman, Jordan. Operating throughout the Arab region, Karama has built a strong coalition with hundreds of partners in thirteen countries—including Egypt, Iraq, Jordan, Lebanon, Libya, Morocco, Palestine, Somalia, South Sudan, Sudan, Syria, Tunisia, and Yemen. Karama works with the broadest network – with women, men, youth, academics, activists, community leaders, politicians, parliamentarians, and others in an effort to end and reform discriminatory laws and practices and promote women’s advancement, security, and protection in all aspects of public and private life. Karama has effected advocacy, capacity-building, knowledge-sharing and exchange, and policymaking at the national, regional, and international levels. Many of our recommendations have been adopted into new and existing constitutions, as well as official recommendations made to the state by international bodies such as the UN. 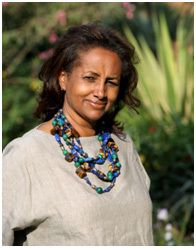 Since 2005, Hibaaq Osman has led a growing movement to end violence violence against women and promote women’s participation across the Arab region. Through Karama – the civil society organisation that she founded in Cairo – Hibaaq has supported women across the region, building networks, institutions and constituencies to promote ideas and build support for positive change for women from Morocco to Yemen. Hibaaq’s innovative approach seeks out women working on the ground to advance women’s rights and security, but who lack the tools and the opportunities to make a greater impact. She provides the strategic advice, capacity building and technical and financial support to foster cooperation, cooperation and collaboration and elevate local campaigns to success at regional and international levels. Her work promotes innovation by harnessing the energy of women leaders and bolstering it with global expertise in political and diplomatic strategy. In pursuing her vision for peace, security, equality and justice, Hibaaq has cultivated linkage and trust at the national, regional and international levels, where it did not before exist. As a result, she has helped launch coalitions including the Libyan Women’s Platform for Peace, the Syrian Women’s Forum for Peace, the Arab Regional Network for Women, Peace and Security and the Arab Regional Network for Women Judges. Hibaaq’s work has been recognized internationally and she writes regularly for international press, including the Huffington Post and Guardian. She been designated one of the 500 Most Influential Muslims and has been a member of UN Women’s Global Civil Society Advisory Group.